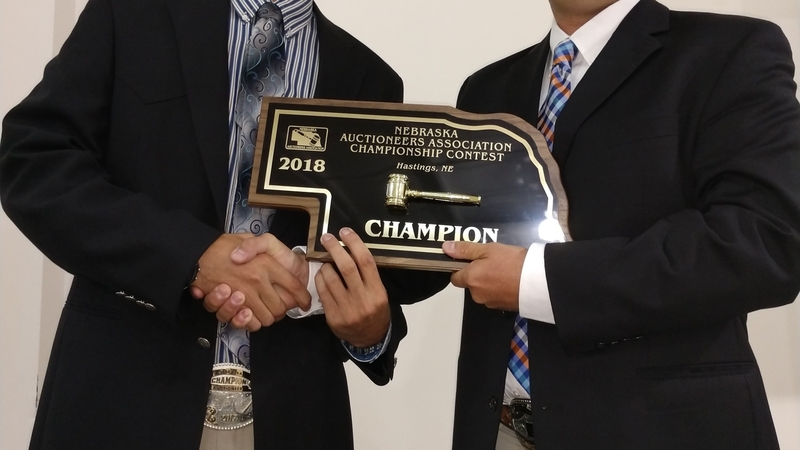 (Hastings, NE) The Nebraska Auctioneers Association, a state trade organization representing the auctioneering profession in Nebraska, conducted their Annual Auctioneer State Championship on Saturday, July 28, 2018. The Championship Competition, crowning both the top auctioneer and ringman, was held in conjunction with a live auction hosted by the Bergman Family and Ruhter Auction & Realty, Inc. The contestants showcased their skills before judges, members and auction attendees in a live auction open to the public. The auctioneer competitors were judged on presentation, chant, voice quality, body language, and other elements of effective auctioneering along with a personal interview. Neil Bouray, Becker & Bouray Auction, Webber, KS, won the title of Champion. The Reserve Champion was Scott Jarman, The Auction Mill, Cedar Bluffs, NE, and placing Runner- up was Justin Banzhaf, Banzhaf Angus & Auctions, Cambridge, NE. 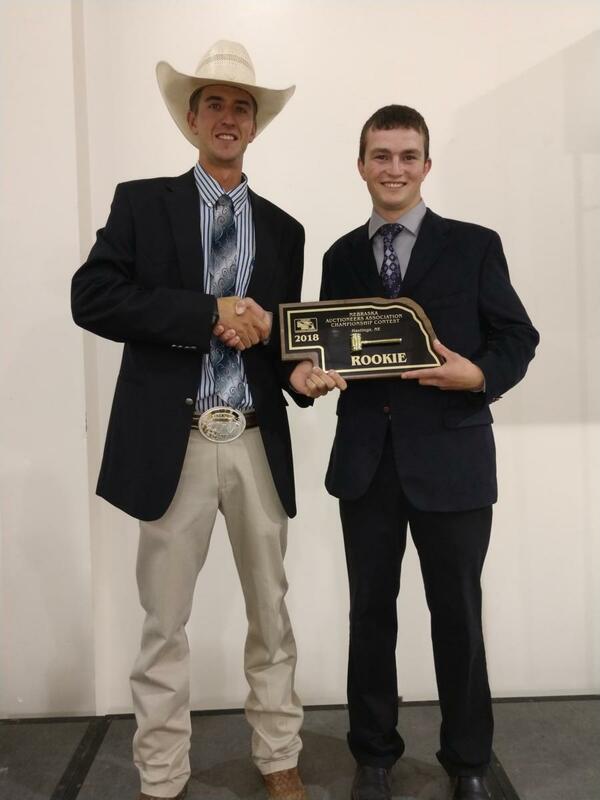 Receiving the Rookie of the Year Award, given to the top auctioneer with three years of experience or less, was Heath Downing, Creston, IA. Rounding out the top ten auction finalists were: John Smith, Broken Bow, NE; Mark Kliewer, Kliewer Auction Service, Aurora, NE; B.J. Reynolds, Taylor & Martin, Inc., Fremont, NE; Kam Hartstack, Hartstack Auction Group, Clarinda, IA; Dallas Kimminau, Sutton Livestock, Hastings, NE, and Clay Schaardt, Schaardt Auction Service, Steinauer, NE. Neil Bouray will now represent Nebraska in the 2019 International Auctioneers Championship at the National Auctioneers Association Convention & Show. The Annual Jon Moravec Memorial Ringman Award was presented to Scott Jarman, The Auction Mill, Cedar Bluffs, NE. The Ringman competitors were judged on presentation, enthusiasm, audience observation, and communication with the auctioneer. The Nebraska Auctioneers Association promotes the auction method of marketing by providing professional training and support for auctioneers in Nebraska. Mark Beacom of Auction Solutions in Omaha, NE is the President of the Association which is headquartered in Rising City, Nebraska. Rounding out the top ten auction finalists were: John Smith, Broken Bow, NE; Mark Kliewer, Kliewer Auction Service, Aurora, NE; B.J. Reynolds, Taylor & Martin, Inc., Fremont, NE; Kam Hartstack, Hartstack Auction Group, Clarinda, IA; Dallas Kimminau, Sutton Livestock, Hastings, NE, and Clay Schaardt, Schaardt Auction Service, Steinauer, NE.